The formula, derived here by the author H.C. Rajpoot, are applicable on a certain no. of the identical circles touching one another at different points, centered at the identical vertices of a spherical polyhedron analogous to an Archimedean solid for calculating the different parameters such as flat radius & arc radius of each circle, total surface area covered by all the circles, percentage of surface area covered etc. These formula are very useful for tiling, packing the identical circles in different patterns & analyzing the spherical surfaces analogous to all 13 Archimedean solids. 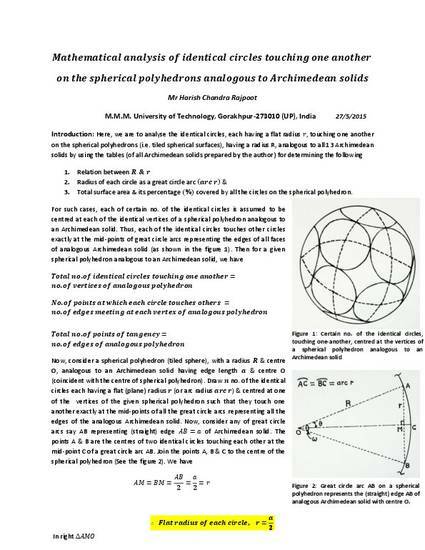 Thus also useful in designing & modelling of tiled spherical surfaces.